Sync without internet. Synchronize large or multiple files quickly via USB. Synchronize files and Outlook data without having internet access. Plug2Sync and Backup is a software solution designed to offer fast and easy synchronization of files, folders and Microsoft Outlook data between computers, without having to depend on internet access. 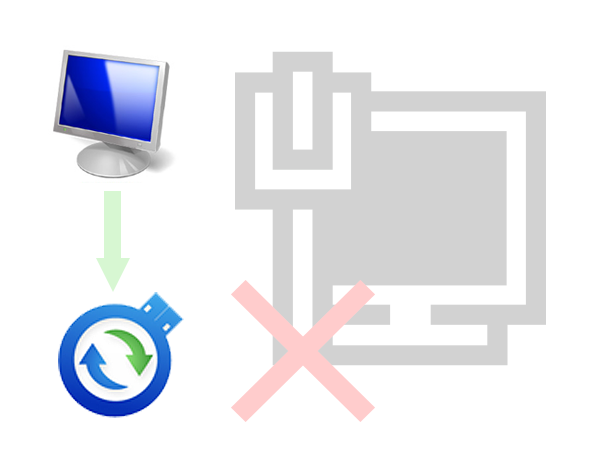 Because the synchronization process can be done through any removable storage device it is possible to sync multiple computers, laptops or Win8 tablets without having internet access. In case you use multiple computers, at work and at home, or in case you travel frequently and take with you only your laptop or tablet, now you can keep your files and Outlook data synchronized easily. All you need is Plug2Sync and Backup and a removable storage device, for example a USB flash drive, SD card or external hard drive, and you can start synchronizing files between multiple PCs, laptops and Windows 8 tablets right away. Because this synchronization software works without internet connection, the limitations of internet-based sync solutions were surpassed and 4Team has been able to include some remarkable features which are hard to find in most sync software products available on the market. 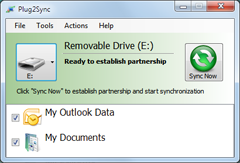 These features give Plug2Sync and Backup a unique versatility and efficiency when it comes to sharing, synchronizing or backing up files and Outlook folders. Sync large files quickly between computers and avoid data transfers over slow connections. Most of the software products designed to synchronize files between computers are internet-based and share the same weakness - transfer speed. These software solutions, provided everything else works perfectly with them, can be only as effective as the connection speed allows them to be. This can be a big problem if the connection is slow or when it comes to a sync process involving large files, especially when there are multiple large files involved. 4Team Corporation addressed this problem that has been frequently mentioned, and with the latest synchronization software released, Plug2Sync and Backup, synchronizing large or multiple files between computers can be done much faster and with maximum data safety. Using Plug2Sync and Backup it is possible to sync large files between computers using any removable storage device and connecting it to the computers where you want the data to be synchronized. After the first synchronization is done, automatic file sync will start each time when the removable storage device is connected to the computer. All changes made to the files selected are detected in real-time and only these changes will be synchronized with the removable storage device, avoiding unnecessary usage of CPU resources. When the storage device will be connected to the second computer, the latest changes will be made automatically. Synchronizing files between computers, laptops, or Win8 tablets over the internet can be both risky and slow, especially when multiple large files are needed to be synchronized. For this reason, Plug2Sync and Backup will prove to be a reliable ‘friend’ that will help you get the job done much faster and in complete safety.